Some bloggers have Wordless Wednesday, showing pictures. Full disclosure: I only remember reading one Wordless Wednesday post, and that blogger used words. I intend to use words,too. I like the pictures she picked! 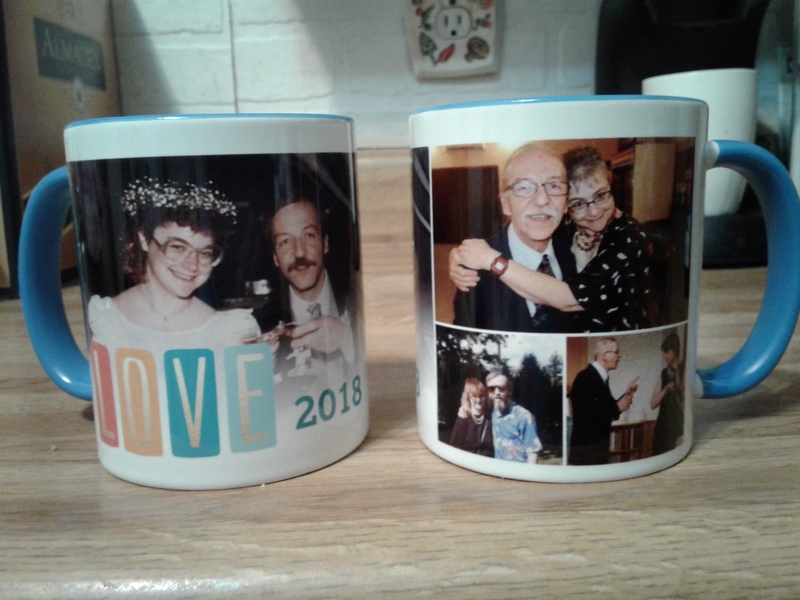 I have been meaning to take a picture of these mugs to share on Facebook, but I’d like to share them here as well. This is the awesome Christmas present my sister, Cheryl, got me and Steven. Even if I did have too many coffee mugs (and I DON’T), these would be a welcome addition to the collection. I did not want to do a post with only one picture, so I took a couple more. Who, me, lolly gag? Say it ain’t so! This is my birthday present from Cheryl. She says it sounds like something I would say. The idea! In fact, I do prefer dilly dallying to lolly gagging, due to the alliteration involved. Steven found a good place to hang the sign when he redid our mantle after Christmas. I’ll have to do some detail shots, to show off specific things. Steven often goes from holiday to holiday with our mantle. After Christmas is Valentine’s Day, sometimes followed by St. Patrick’s Day, sometimes going directly into Easter… This year, he went with an any time theme. Actually, he added a couple of Valentine rubber duckies, in honor of February 14th, but I don’t know if you can see them in this picture. So this is my Wednesday post. I think it is a bit of a Wuss-out Wednesday, because all I did was share a few pictures and chatter about them. I do not think it is such a much as a Wordless Wednesday, though, because I am over 250 words. I can’t do anything right. Oh well, as usual I am going to hit Publish and hope for the best. Hope to see you all on Non-Sequitur Thursday. Posted in humor, personal, Uncategorized, Wordless Wednesday, Wuss Out Wednesday and tagged birthday present, blog post, blogging, Christmas, Christmas presents, decorating for the holidays, home decorating, husband Steven, mantle, sister Cheryl. Bookmark the permalink. 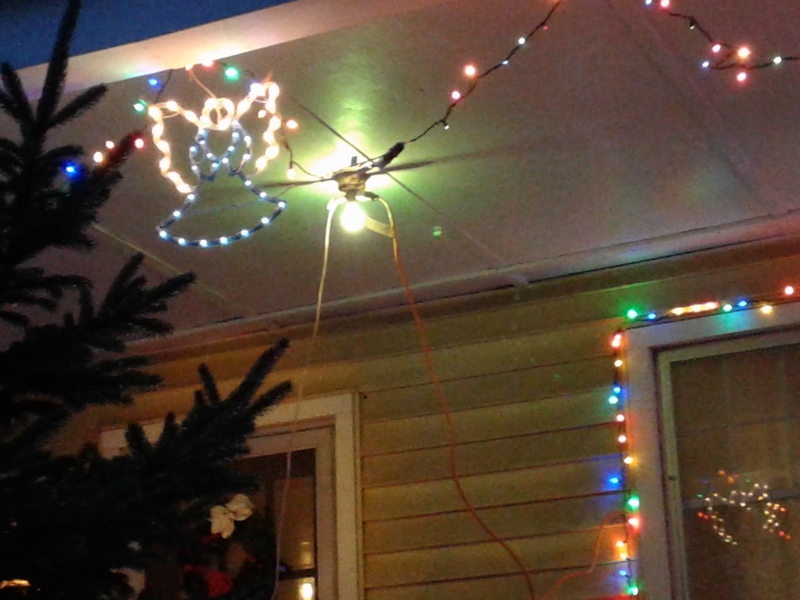 Steven and I had an at-home adventure today by taking down the Christmas lights on our front porch. We are not the last house in Herkimer to do this, but we were among the last hold-outs. 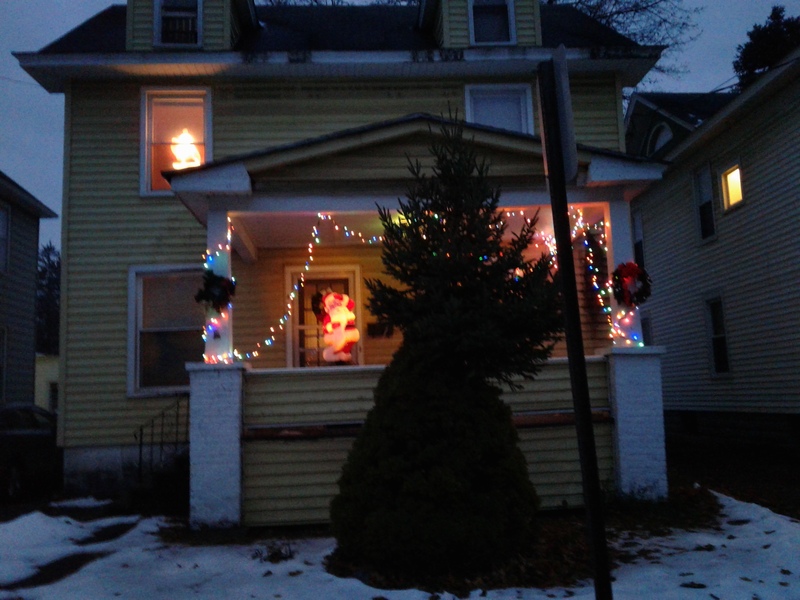 Tradition says you keep your Christmas decorations up till Jan. 6, The Feast of the Epiphany. I read that in a novel many years ago. Somebody pulled down some holly that was in the way, and the heroine had bad luck. It made an impression. Also, I hate to let go of the holiday. See how happy we looked? 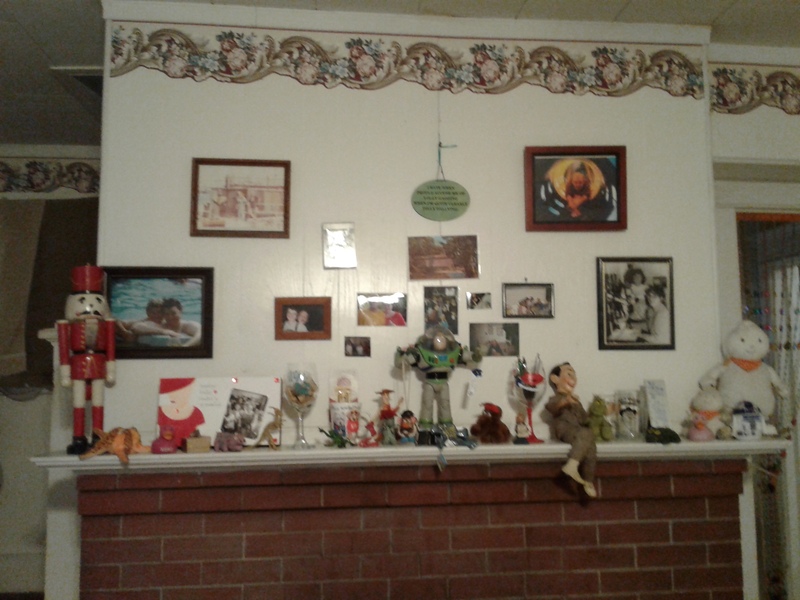 OK, this is the real reason I decided to write my post about taking down the decorations: I wanted an excuse to use the pictures again. I thought a few pictures would cheer me up on a dreary January Tired Tuesday. I could use a guardian angel. Writing that caption made me think of the theory that we are here to be angels for each other. I must think of something angelic to do for someone. That might alleviate my post-Christmas letdown. Maybe a softer light bulb next Christmas. 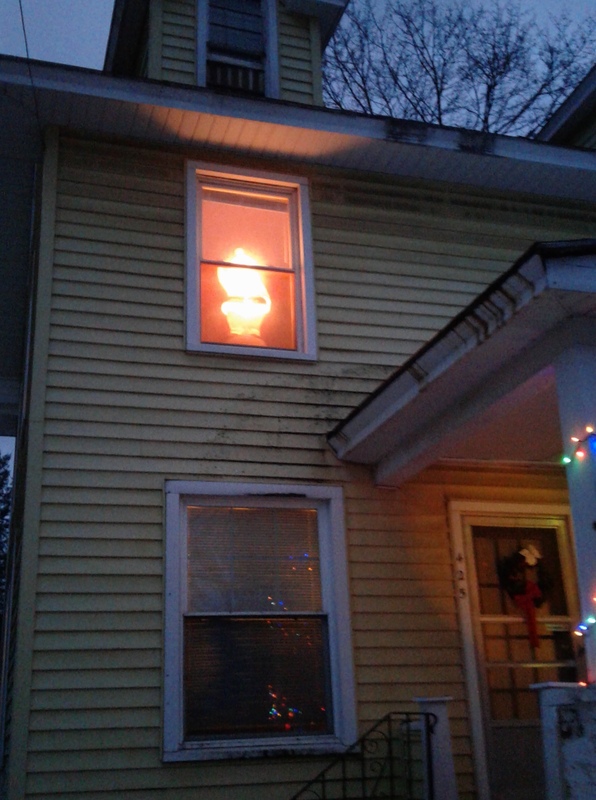 Regular readers may remember we put that Santa in the upstairs window because after I carried him down from the attic I did not feel able to make it down another flight of stairs. Lifting him to put him away, I realized why. Steven had put a rock inside the Santa last year when he was out on the porch. How did I not notice that before? In any case, I carried Santa back up the attic without mishap, so yay, me. 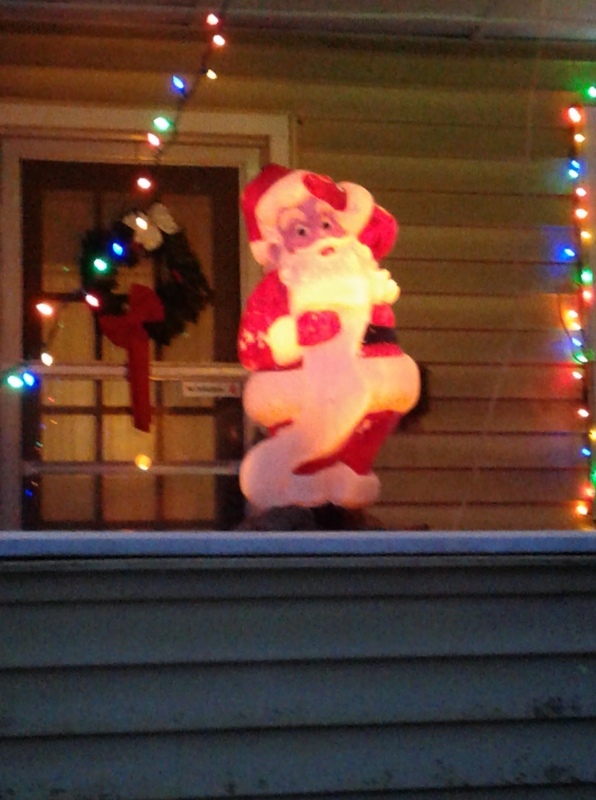 And here is this year’s porch Santa. 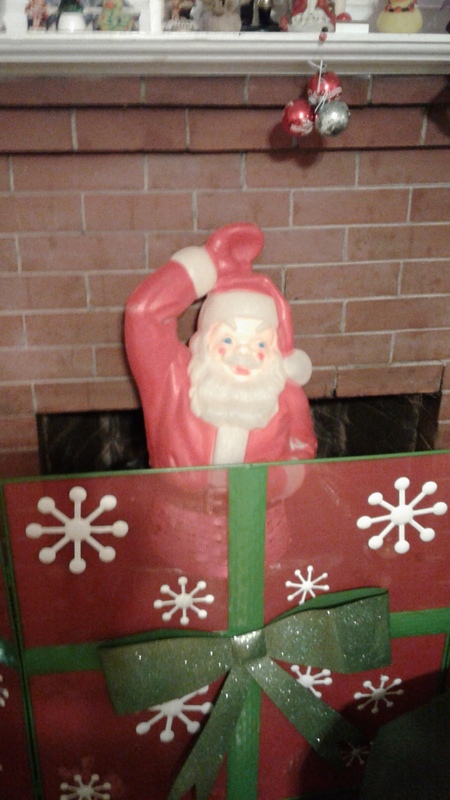 This Santa Claus lives on our landing year round, because we love him so much. My Mom and Dad found him in an antique shop in Pennsylvania. I do love a vintage Santa. Speaking of vintage, I think it is wine o’clock. We put away decorations. I made my blog post. I think I am doing all right for a Tired Tuesday. Posted in humor, personal, Tired Tuesday and tagged blog post, blogging, Christmas, Christmas decorations, Feast of the Epiphany, Santa Claus, tired, vintage. Bookmark the permalink. 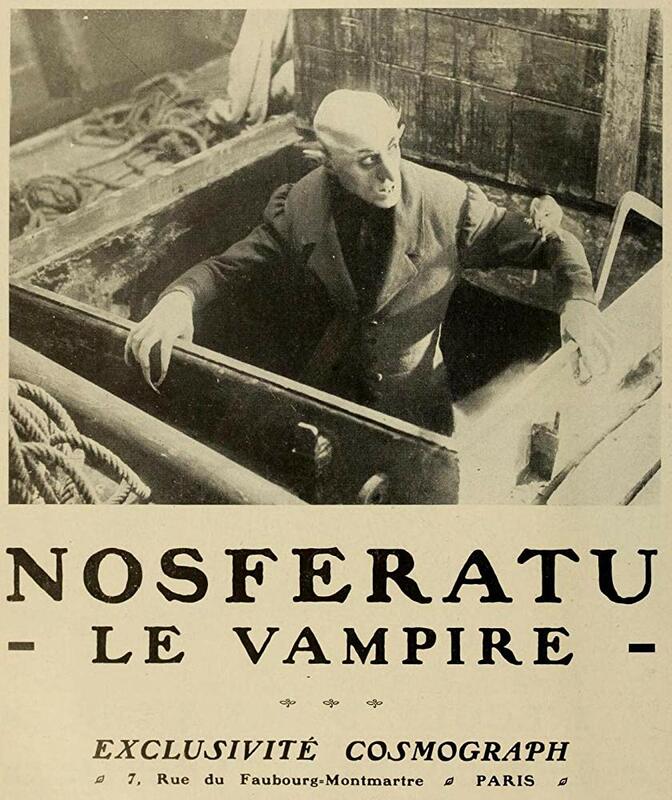 When in doubt, open with a vampire. I came across a new picture of one of my favorite guys earlier today on Facebook and downloaded it. I should have known it would immediately come in handy when I realized I don’t have a whole lot to blog about today. The fact is I am deep in the throes of a massive Post-Holiday and — even worse — End of Vacation letdown. But I am uncomfortably conscious of really being someone “with nothing to complain about.” I put it in quotes, because it is kind of a cliche. Now it is not only post-Christmas and Back to Work that is bothering me, it is that everything I type in sounds so stupid to me! Have I suddenly lost all ability to write? SAY IT AIN’T SO!!! It’s no use: I am down and, as I often say, sometimes you just have to feel that way until you don’t feel that way any more. In the meantime, there is no point in dragging others down with me. I’ll throw in a couple more pictures, maybe make a couple jokes, and call it a Tired Tuesday post. Who can resist a sweet puppy? 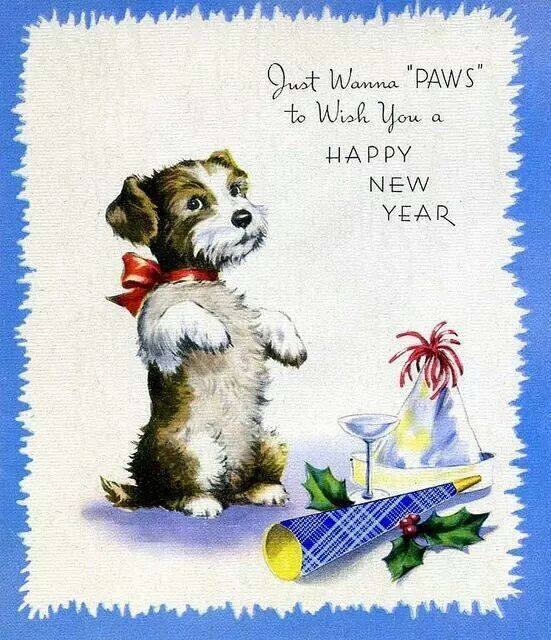 I just peeked back at Facebook, and this cute card from the 1950’s caught my eye. After all, I’m not ALL about monsters, murder and mayhem. 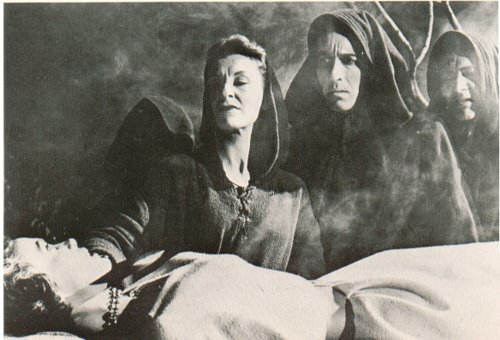 Do you recognize a young Christopher Lee? However, since I am somewhat about monsters, murder and mayhem, I end with a picture of Horror Hotel (1960), which I recently found out is also known as City of the Dead, although it is really more of a village. But I digress. So this is my New Year’s Day Tired Tuesday post. Here is a Freudian typo for you: I first put “Tried Tuesday.” Get it? I TRIED to make a decent blog post. I shall try again tomorrow. As always, I hope you’ll stay tuned. Posted in humor, personal, Tired Tuesday and tagged back to work, blog post, blogging, Christmas, end of vacation, feeling down, horror hotel, mayhem, monsters, murder, New Year's Day, Nosferatu, post Christmas letdown. Bookmark the permalink. One of the all time great posters. 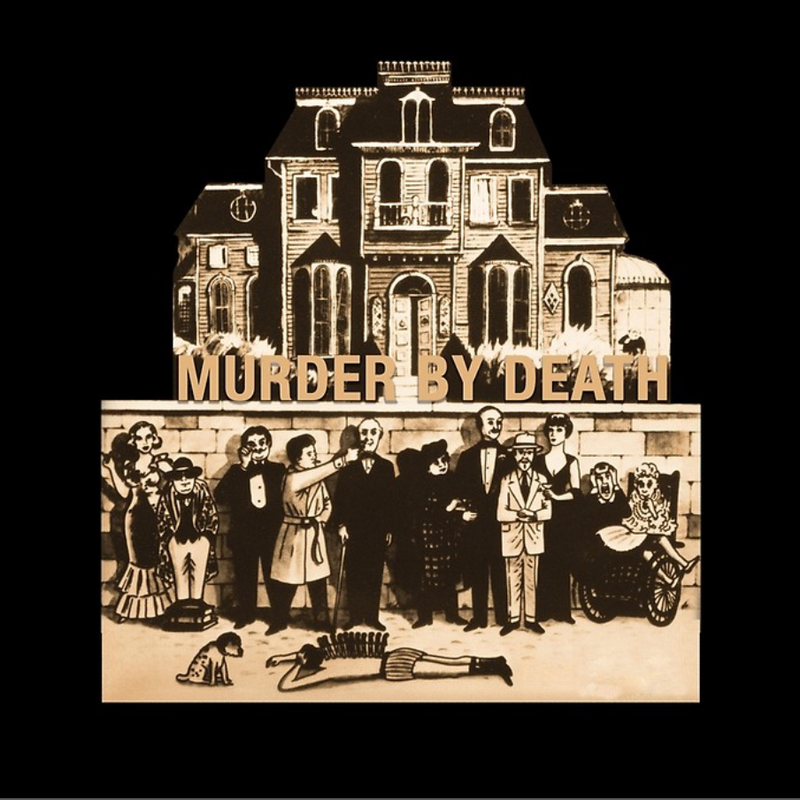 Right now we are enjoying one of our go-to silly movies, Murder by Death (1976). Earlier we were watching Forensic Files. I do love a true crime documentary, but I was reaching manic levels of sick-of-it regarding a song that was playing during a promo of upcoming attractions that played during every commercial break (good song, not even a bad version of it, but you can have too much of a good thing). Earlier yet, I went Mohawk Valley adventuring with my sister Cheryl. We went to Fort Plain Antiques and Salvage, and Mohawk Antique Mall. I brought my Tablet with me but only took one picture. Still, I could write a blog post giving a proper plug to these two fun shopping destinations. Speaking of “could write a blog post,” I went running this morning. Yay, me. I really need to sit down and write a Running Commentary soon after one of these runs. I am thinking, however, that right now I am over 200 words and I am going to call this a Wuss-out Wednesday. What do you want a day after a major holiday? Miracles, I suppose. Well, we can always hope for what tomorrow may bring. Happy Day After Christmas, everyone! Posted in humor, personal, Wuss Out Wednesday and tagged blog post, blogging, Christmas, Fort Plain Antiques and Salvage, Mohawk Antiques Mall, Murder by Death, not writing, post Christmas letdown, writing. Bookmark the permalink. I felt free to have a Monstrous Monday on Christmas Eve, so nobody need be surprised that I am having a Tired Tuesday on Christmas Day. Hey, being merry can take a toll on an old broad like me! At least I will try to refrain from whining about my oncoming post-Christmas letdown. But no promises. I had meant to take some pictures of my mother’s lovely Christmas decorations, which would have livened things up a bit. Oh well, I fell down on the job. How about instead I visit Christmas Past and see what kind of photos I have in my Media Library. Here is one of my favorite decorations from 2016. The fireplace screen was given to us by my parents the previous year (I think). The Santa Claus, which is in fact only a partial one, was found by the ladies at Herkimer County Historical Society, after he blew from his rightful home during a wind storm. They posted his picture on Facebook, but when the owner was not found, gave the Santa to the good home they knew Steven and I would provide. Two very nice people wishing each other merry. 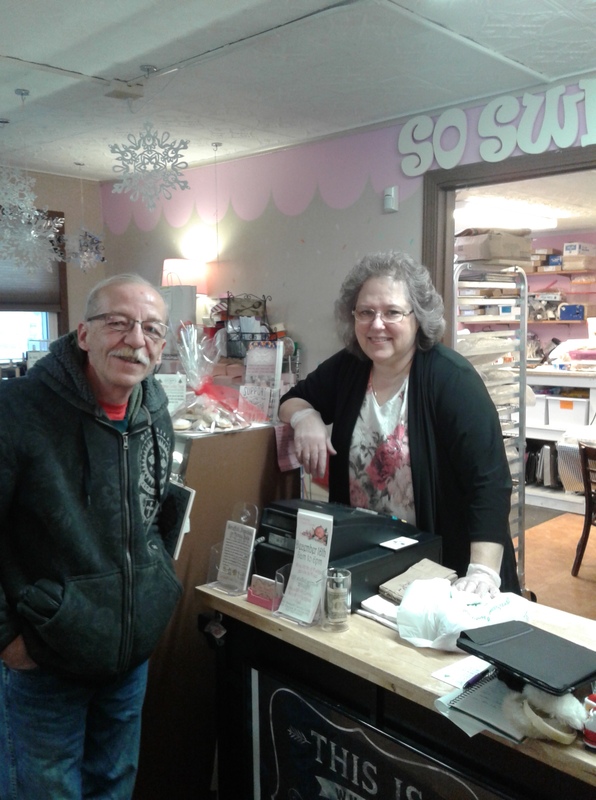 This is my dear husband Steven and our friend Margaret, who owns the So Sweet Candy Cafe in Utica. We did not make it there before Christmas but I hope to pay them a visit in the next few days. For one reason, my sister Cheryl brought some of Margaret’s treats to my parents, and I have two words for you: Sugar. Plums. I thought I had had them before and liked them, but I hadn’t tasted anything yet. Go to the So Sweet and buy some! And if they’re all gone by the time I get there, it serves me right! I’ll be more beforehand next Christmas! Hmmm…. it seems like Steven got me more presents in previous years. I end with a Cavalcade of Claus, just in inject a bit of alliteration (I’m almost never too tired to alliterate). 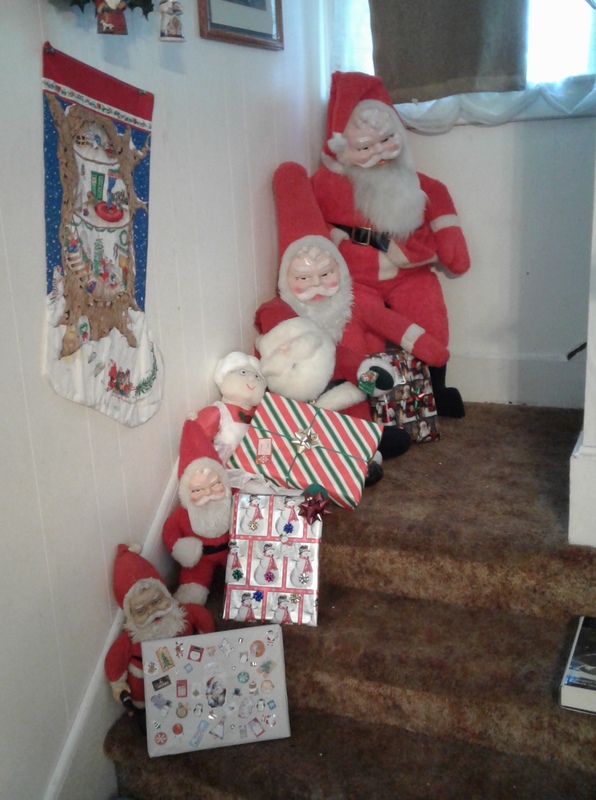 We got these Santa’s at different times, and we love them all. I also do not rule out acquiring more versions of the man in the red suit. But that is for Christmas Yet to Come. Posted in humor, personal, Tired Tuesday and tagged blog post, blogging, Christmas, Christmas decorations, Christmas treats, local business, Santa Claus, So Sweet Candy Cafe, sugar plums, tired. Bookmark the permalink. His expression is not as festive as his attire. Well, why not have a Monstrous Monday on Christmas Eve? For one reason, I don’t have much else. I went running this morning, intending to do a Running Commentary. Steven and I had breakfast at Heidelberg Cafe in Herkimer, NY prior to picking up rolls for tomorrow’s Christmas feast, so I could have done a shout-out to a local business. Well, sometimes these things do not work out. Right now I want to get back to celebrating Christmas Eve with my loved ones, so I will attempt to come up with something mildly entertaining at least. 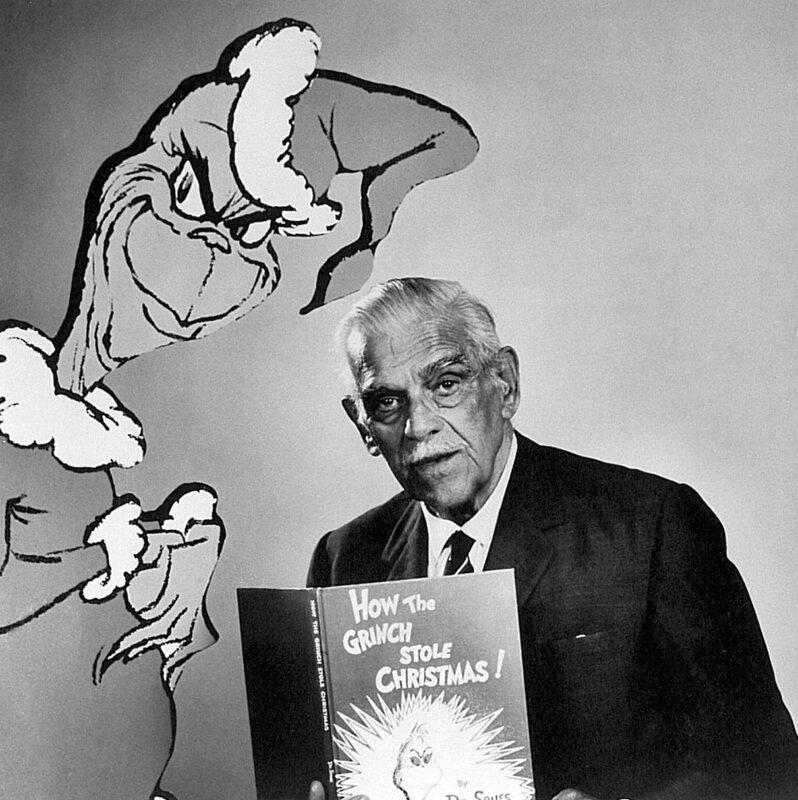 What could be more Monstrous Christmas Eve than Boris Karloff reading “How the Grinch Stole Christmas”? Who doesn’t love a ghost at Christmas? We watched two different versions of A Christmas Carol yesterday and might have watched a third if I hadn’t pooped out (I only mentioned one in my blog post; do you suppose I should go back and edit?). 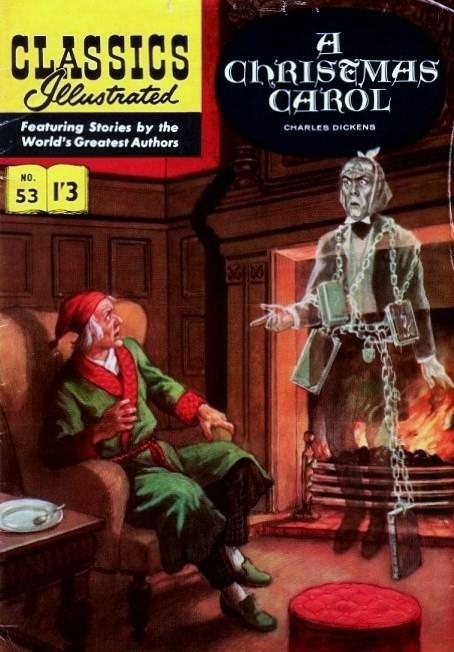 It is perhaps the most famous Christmas ghost story. And now I see that I am over 200 words. Regular readers know I call that respectable, especially for my more foolish posts. 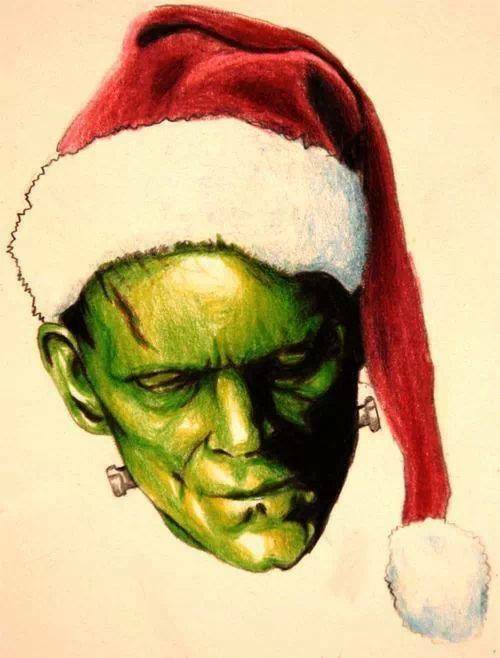 Happy Christmas Eve and Monstrous Monday, everyone! Posted in humor, Monstrous Monday, personal and tagged A Christmas Carol, blog post, blogging, Boris Karloff, Christmas, christmas eve, Frankenstein, ghost stories, How the Grinch Stole Christmas, monsters. Bookmark the permalink. I had hoped to do a Sunday Running Commentary, even went for a run this morning, but then I spent some time with Christmas mixing and fixing, then some time having a couple of drinks and relaxing, watching Christmas movies, so now I’m here ready to do a Sunday Cinema as usual (was that a run-on sentence? I don’t care if it is and I am too lazy to check in any case). At least we watched some seasonal movies, so there’s that. 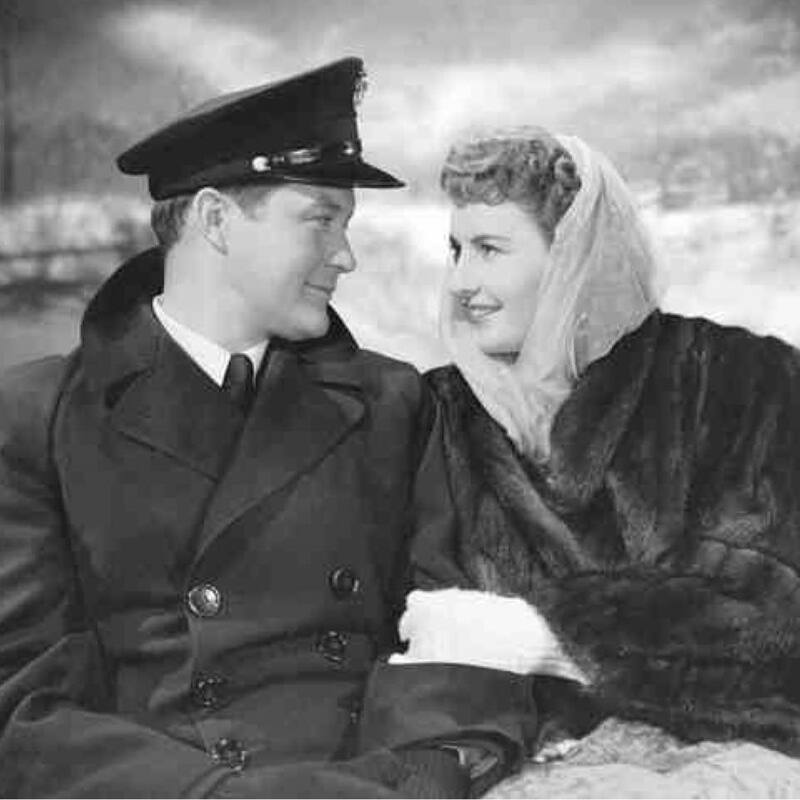 My main thing was, I did not feel like crying, so no It’s a Wonderful Life, no Homecoming, and not just any Christmas Carol. When Steven suggested Christmas in Connecticut, I thought that sounded perfect. Just a sweet love story involving people pretending to be something they’re not (that’s not giving away any important plot points, it’s part of the set-up). 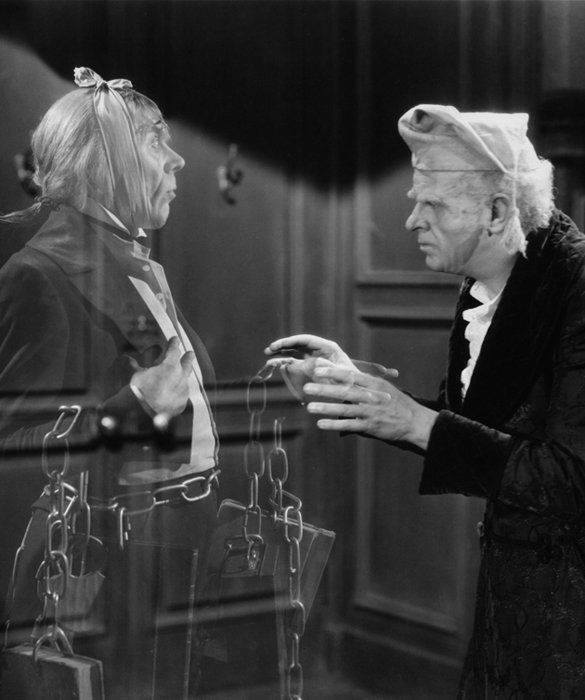 After that I suggested the fun version of A Christmas Carol with Reginald Owen as Ebenezer Scrooge. Jacob Marley reminded me a little bit of the butler in And Then There Were None, but Steven told it was Leo G. Carroll, who used to be in The Man From Uncle. 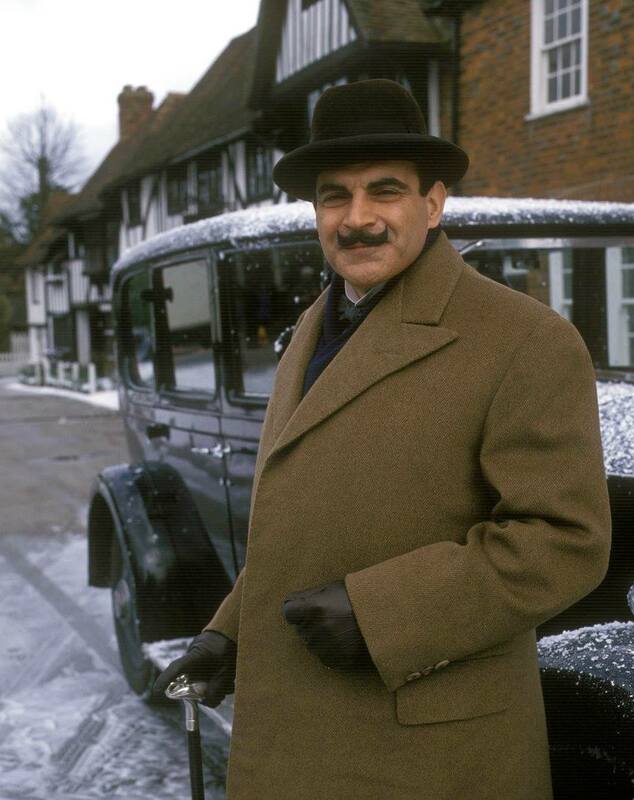 After that one, I was wishing we had a Christmas murder mystery, when I remembered, just before Steven suggested, Hercule Poiroit’s Christmas, an episode of the Poirot television series starting David Suchet. I had read the book this was based on many times before seeing the movie. I have a number of problems with the adaptation, but it’s a fun watch, and, David Suchet, there could be no possible objection. Poirot is an fun character for an actor to portray (or so I would think, having never had the opportunity to play him), and Suchet does an excellent job. I have also enjoyed Albert Finney’s and Peter Ustinov’s interpretation of the part. I need to check out Kenneth Branaugh’s Poirot, but that’s a whole other blog post. In the meantime, it’s Christmas Eve Eve. I need to get back to my tv-watching, crocheting portion of the evening. For one thing, I need to recruit my energies for tomorrow. Happy Sunday, everyone. Posted in humor, personal, Sunday Cinema and tagged A Christmas Carroll, blog post, blogging, Christmas, Christmas Eve Eve, Christmas in Connecticut, Christmas movies, David Suchet, Hercule Poiroit, Hercule Poirout's Christmas, movies, Reginald Owen, running, running commentary. Bookmark the permalink.